It's been a long time, not only since I updated the blog, but since we've had any news about our big Daspletosaurus specimen that we dug up in 2006. Well, that's changing now. This is basically an update on a post from a few months back where I covered the scanning and printing process if the leg. To get the project moving along we picked some of the low hanging fruit: finishing the left leg! Since this leg was almost complete (missing just one phalanx and strangely, metatarsal III) the restoration was pretty straightforward, comprising of just crack filling. The digits were molded in gang molds and we produced a mighty fine block of metatarsals II through IV. That block as well as the long bones were molded so that they can be loaded onto our spin casting machine, enabling us to make high-fidelity hollow casts (saves a lot of weight) that we later fill with urethane foam for durability. Cast copy of the left pes ready for assembly. 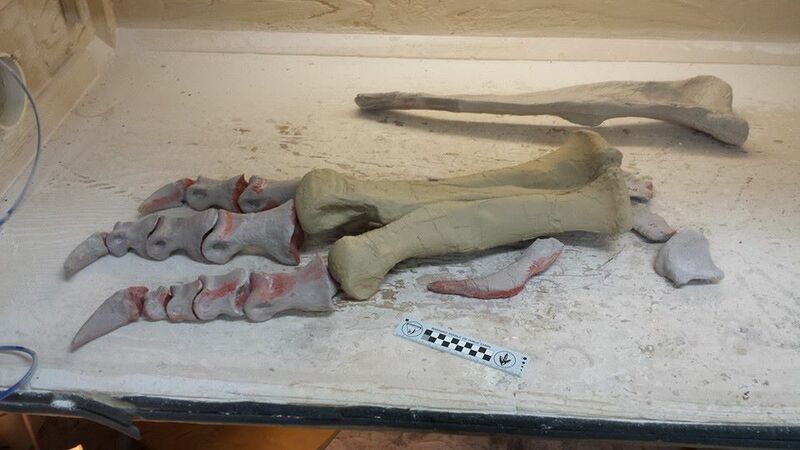 This leg should be ready for display in about 10 days, so don't forget to come by the museum to check it out.